One of the best things about cold weather is hot chocolate. Right? I know my kids would agree with me. 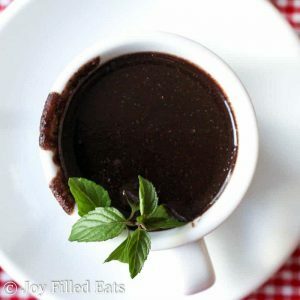 There is something special about coming in from the cold and warming up with a big mug of rich chocolaty goodness. The best part about this particular hot chocolate is that you can put all the ingredients in the crock pot before you head outside and it will be ready when you come back in. Or, if you are entertaining you can set this up with mugs and sprigs of peppermint and your guests can serve themselves. One of our favorite family activities is our town’s Holiday Lights Parade. We live on Main Street so the parade goes right by my house. All the local towns decorate their fire trucks, ambulances, and police cars with Christmas lights. It is such fun to see them go past all lit up. It is generally pretty cold the first weekend of December so I love having hot chocolate ready to go for when we return to the warmth with cold noses and pink cheeks. I’ve been trying to reduce the dairy in my diet. I suspect that my weight loss stall is in part to too many heavy S meals. In the Trim Healthy Mama diet a heavy S meal is a meal that has a lot of cheese, cream, etc. A good way for my to reduce dairy is to sub in Silk Cashewmilk and Almondmilk when I would normally have used half and half or cream. I’ve started drinking my morning coffee with the Silk Cashewmilk and I enjoy it. With the busy holiday season coming I need to keep life simple. Silk has a sleek new package design but the same great taste. 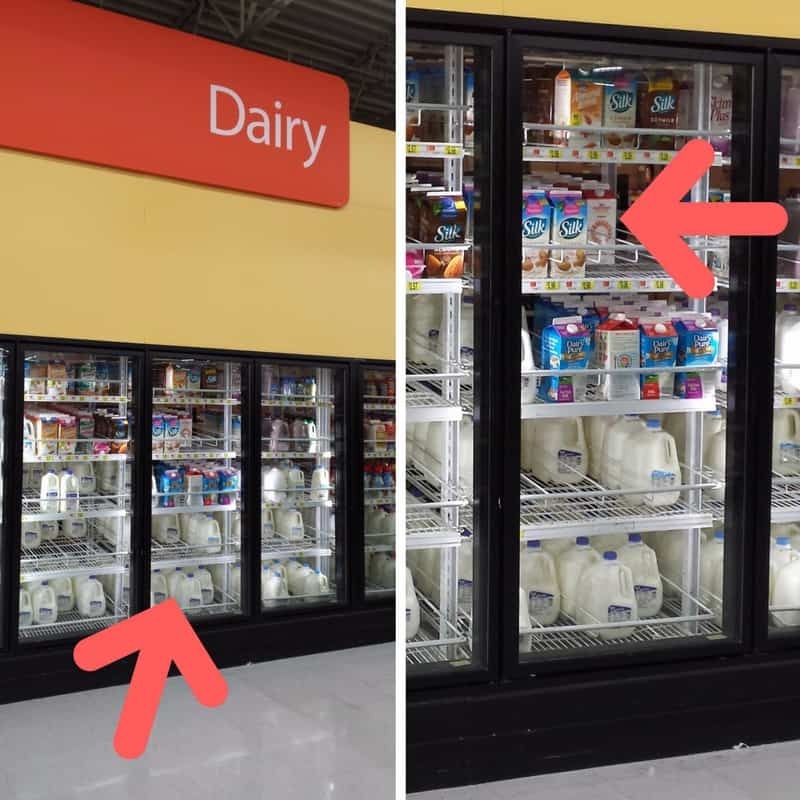 When I went to my local Wal-Mart to buy Silk Almondmilk and Cashewmilk I thought the packaging stood out compared to other brand’s with similar products. 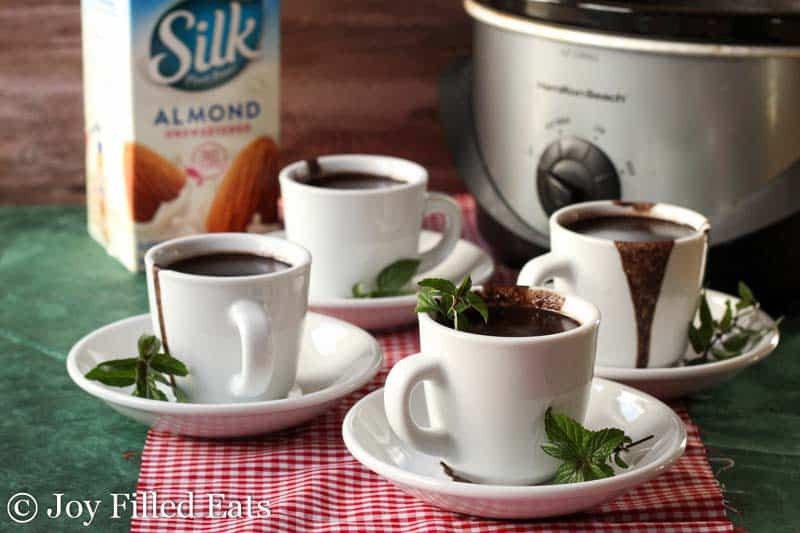 I chose to use the Silk Almondmilk in my hot chocolate but you can really use any of Silk’s unsweetened dairy free milks. 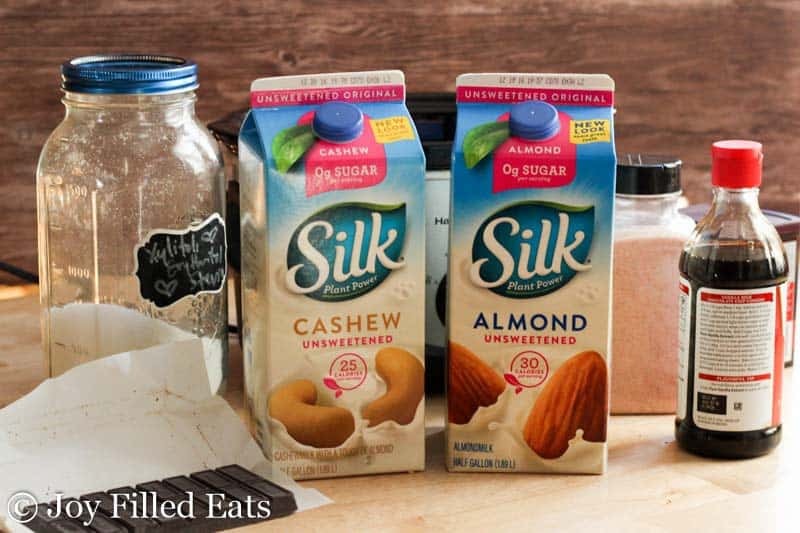 You can use Silk Almondmilk or Cashewmilk in your favorite everyday or holiday recipes. 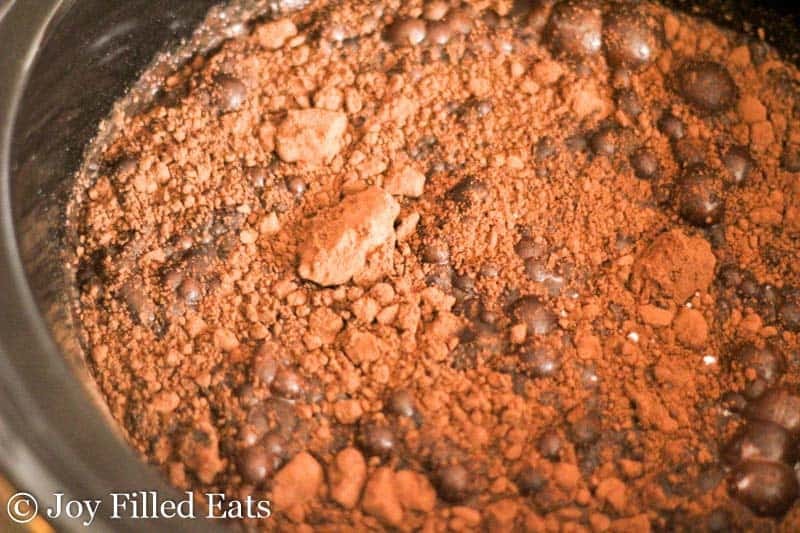 Make sure to visit Silk.com for more great recipes. Combine all the ingredients in a crock pot. Whisk well. Cook on high for 1 hour. 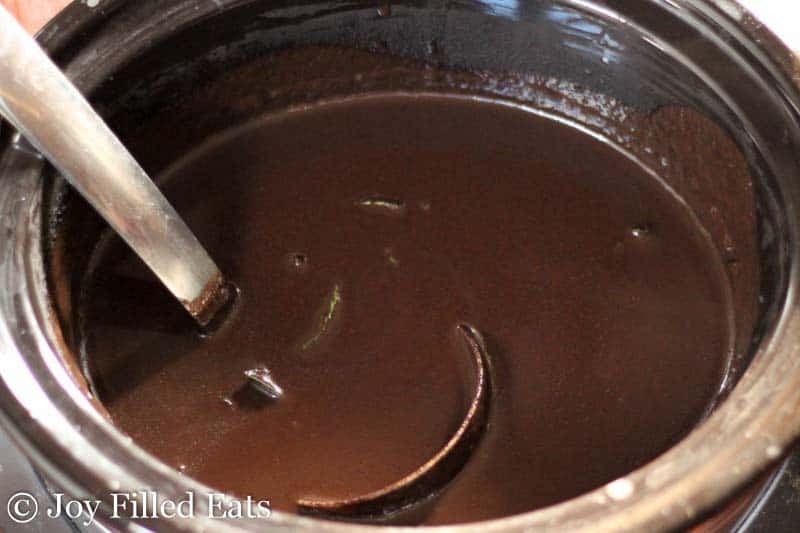 Whisk to make sure the baking chocolate is melted. Turn to low and serve. You can keep it on low for up to 3 hours. If you need to keep it hot longer turn to the keep warm setting to avoid the hot chocolate burning. This is thick and rich. 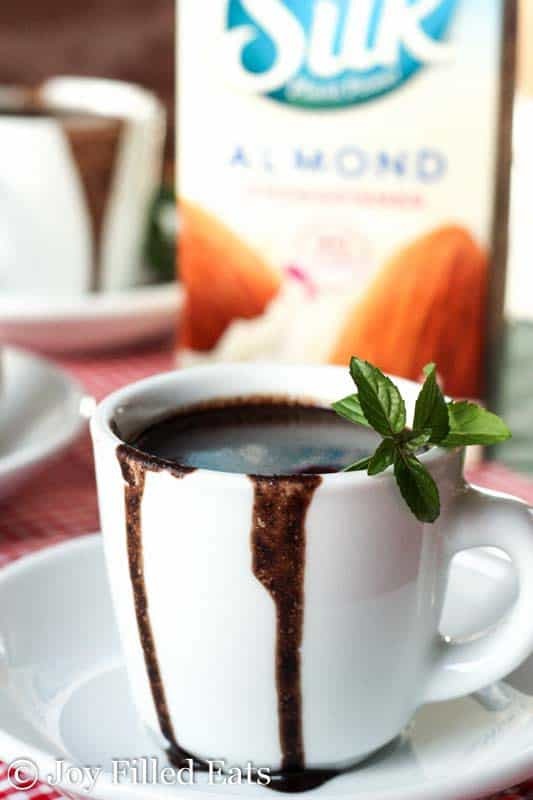 If you prefer a thinner hot chocolate you can add more almond milk. 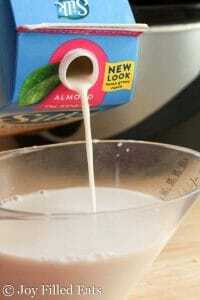 I recommend starting with 1 tsp peppermint extract and then adding more right before serving if you want it mintier. A little goes a long way. What kind of coconut milk do u use? I'm sure it is unsweetened. Oh, how I love hot chocolate. It will be nice to mix it up a bit by using mint! This looks so rich and decadent! Mint sounds like the perfect addition! What a great idea for making hot chocolate. I like the addition of the mint. My kids are already asking if it's hot chocolate weather! I have not made hot chocolate in the slow cooker before. Sounds lovely, as it would stay warm for a long time. I think my kids would love having a huge crock of this at the ready! Oh this looks divine! Chocolate and mint is such a winning combination! This looks amazing. Here's my question/thought: I make this just as it states and then I can reheat it each day until it's gone. What do you think? That's a great question. I don't see why not. I would divide it up into little mason jars just in case it separates in the fridge. That way each would have all the components. It it separates you can just give it a good mix before drinking. That's a wonderful idea. I'll definitely do that. We have a terrific milk frother and warmer that will heat it up nicely each morning. Thanks again for the recipe.